The HSSC Patwari Recruitment 2019 notification has not published yet. But it is expected that the notification will be released soon by HSSC. An official notification will available on www.hssc.gov.in. Haryana Staff Selection Commission (HSSC) will invite applications for recruitment to various posts in the irrigation and water resources department. Apply for these positions from www.testhill.com. Candidates of General category will have to pay an application fee of Rs. 100. Apart from this, an application fee of Rs 50 for women and Rs 25 for SC / BC / SBC / EBPG has been kept. 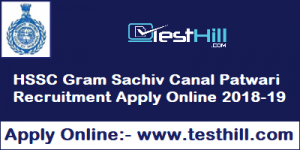 Candidates can apply online from the Haryana SSC website soon. given to candidates possessing a higher qualification.